IBM® Intelligent Operations Center is an integrated solution. It provides a rich set of capabilities and line of business tools that business users with domain expertise and no technical background can use without customization. IBM Intelligent Operations Center also provides services and extension points that developers can use to extend the IBM Intelligent Operations Center standard functions and develop capabilities specific to the domain and client requirements. IBM Intelligent Operations Center includes an application-based programming model that supports all the interactions with the solution components. The programming model is based on industry standard Representational State Transfer (REST) and Java technologies. IBM Intelligent Operations Center includes a full set of REST and Java application programming interfaces (APIs) that provide a simplified development environment and make the platform easy to extend and customize for a large community of developers. 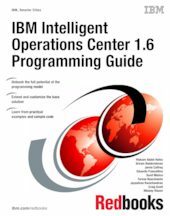 This IBM Redbooks® publication gives a broad understanding of the IBM Intelligent Operations Center 1.6.0.1 programming model and available extension points. Many of the chapters describe working examples and usage scenarios that demonstrate how to extend the IBM Intelligent Operations Center base platform. This book includes sample code that can be downloaded from the IBM Redbooks website. Readers of this book will benefit from the IBM Redbooks publication IBM® Intelligent Operations Center 1.5 to 1.6 Migration Guide , SG24-8202.